The garden railway "Nad Mniší horou - Rakovec"
The photogallery of the garden railway "Nad Mniší horou - Rakovec" in Brno have a several partitions of the pages. 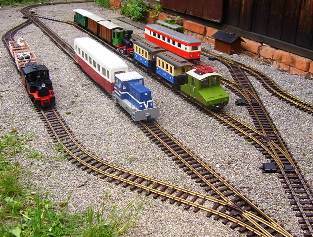 They are the photos of the models locos, cars and building from origin railways. 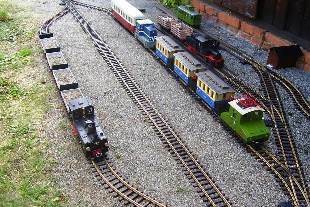 We can find here the small locos and cars from the field railway (Diana), but to we can find the big elecric locos and cars from RhB and FO and WSB from swiss narrow gauge railway. The medium locos and cars are from Czech republic and for all from Germany (JHMD, ČSD, ČD, DR, HSB and RüB). 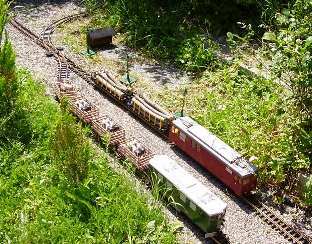 The next part of the photogallery shows the operations of the garden railway in the years 2003-2013.